Balance. How many runners out there own “balanced” as a trait? You eat a plate of different colored foods, go to yoga (occasionally but it counts! ), spend time at the gym doing strength work as running gurus suggest, sleep often. This is balance. Now how many of you can lift one leg off the ground and continue to read this without falling over? Pick yourself up off the ground if it didn’t work out, sit, and let me tell you about balance. As we run, our two feet are never on the ground at the same time. We expect each leg, on it’s own, to hold us up and propel us forward as we cycle through gait. 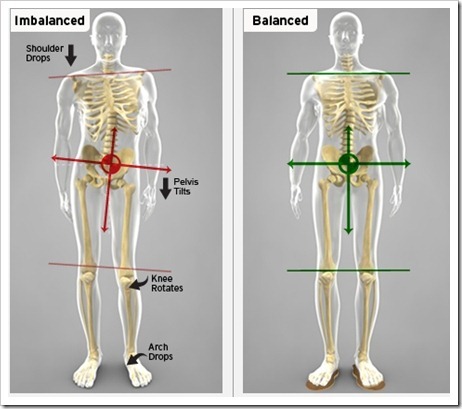 Simply standing on one leg, your support limb is working really hard to keep your other hip up - which is known as stability. When we add forward motion that standing leg's muscle must provide enough capacity to propel our bodies through space in addition to not allowing our other side to drop down. That means the stance leg has to be really strong in multiple directions – which is why we have a lot of muscles that cross the hip joint and work together to make running beautiful! If you find yourself unable to stand on one leg in quiet standing, think about the muscle imbalances that exist and work against you while running! The body will make compensations and allow us to run even if our hips are weak and stability is decreased – as in, you don’t see people trying to run and falling all over the place in Central Park. However, when muscles try to work harder than they are capable, or too much at an action they really aren’t designed for, we suffer from varying degrees of overuse, strain, tendinopathy, joint dysfunction, and pain. This is a PSA for all runners to start addressing balance- in the weight room, at work, in the living room – it all counts. Stand on one leg as you brush your teeth or cook dinner, try some single leg squats or deadlifts (shown below) - being aware of your opposite hip and controlling it if it drops down. If you have some odd pains with running or are concerned about your stability, #getPTfirst !